I love this time of year! I love watching my little girl play outside. It is her heaven. She loves the outdoors, parks, walks… basically anything that gets her out of the house she has been stuck in all winter long. On days that we are outside, I hate stressing about what to make for dinner or even coming in early enough to get it started. 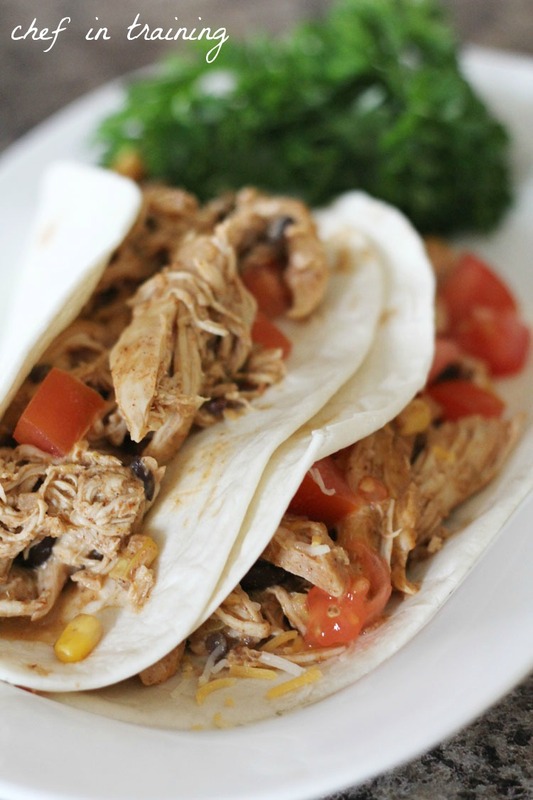 Crock pot meals make that so easy for me. Stick in all in the crock pot in the morning, and have very little prep to do for dinner time. They are my favorite. This meal was incredible. My entire family enjoyed it and it was extremely easy to make! 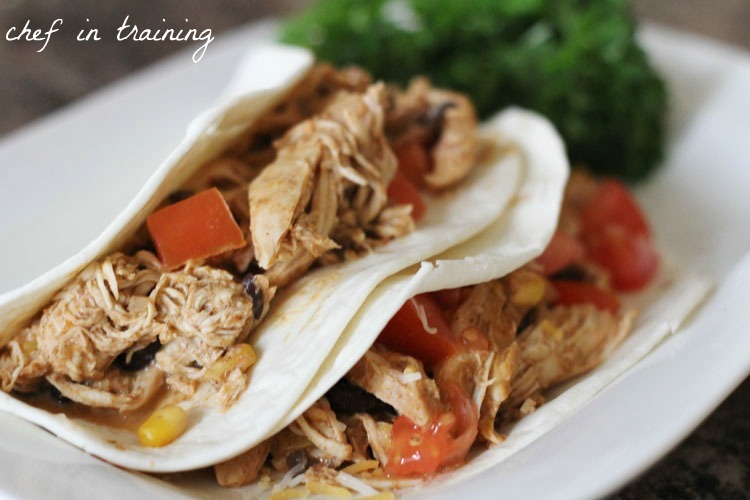 Place chicken breasts in the slow-cooker and cover with the broth, salsa, corn, beans and taco seasoning. Remove the chicken and either shred it or cut it up into bite-size pieces. In a small bowl, combine the cornstarch and water; stir until smooth. Stir cornstarch mixture into the slow-cooker mixture. Put the chicken back into the slow-cooker. Keep lid off; turn to HIGH and let the mixture thicken for about 30 minutes. Spoon the chicken mixture over tortillas and sprinkle with cheese and diced tomatoes. Do the chicken need to be de-frosted? or can they still be frozen? Beautiful. Great Job on your new site! Love it! Ohhh Nikki, what wonderful recipes. Thank you for sharing. I´ll try this this weekend. This looks delicious! So easy too. I found you via tip junkie's link party! Do you have the nutritional values for this recipe? It's so good! This was delicious!! I added a small can of diced green chiles. Tomorrow's leftovers are being served over rice.